Domaine de Beauvallon. This sanctuary of space where time seems to stand still sits in an enviable position above the Bay of Saint-Tropez. Effortlessly combining heritage, nature and comfortable contemporary style, Le Beauvallon is in harmony with the very best of life. Over the decades, Le Beauvallon has welcomed eminent artists to writers and politicians. Distinguished guests have included Colette, Audrey Hepburn, Pierre Cardin, F. Scott Fitzgerald, Sir Winston and Lady Churchill, Senator Edward Kennedy, the Grand Duchess of Luxembourg amongst others. Quite aside from the impressive commissioned art collection that features throughout the property, one of the most important commissions was the restoration of the original ceiling in the Salon Sud. This hand-painted ceiling was meticulously worked by a team of archive artists from Nice who recreated this to its original splendour from the remains found behind a myriad of pipes and electrical wirings. The property is situated in the Var Department of France on the Côte d’Azur, brilliantly position between the charming seaside towns of Sainte Maxime and Port Grimaud, opposite Saint-Tropez. Saint-Tropez takes less than 7 minutes to reach by the propertys shuttle boat. The 18-hole Golf Club de Beauvallon and Tennis Club de Beauvallon are just a stone’s throw away. As the garden unfurls towards the azure blue waters of the Bay of Saint-Tropez, guests traverse a private tunnel to arrive at poolside. A beautiful stylised pool surrounded by lush landscaping sits nearly at the water’s edge, looking out towards Saint-Tropez. At its heart is the summer pavilion, designed by Pritzker prize-winning Japanese architect, Toyo Ito and Cecil Balmond. This is the place to savour the magnificence of Riviera summers. Le Beauvallon can be booked exclusively all year-round for special occasions and / or for family holidays. 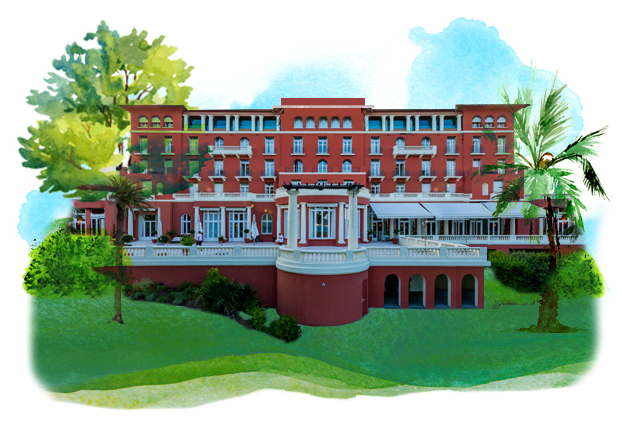 That’s just you, your friends and family in your own private Belle Époque palace on the Côte d’Azur. Combining the lingering elegance of the early 20th-century remains and all the contemporary trappings, Le Beauvallon has accommodation for 88 guests with 26 elegant suites and 14 mountain view rooms. Each one is individually styled, all of them feature magical views and above all, designed with comfort in mind. The major regional airport in Nice is just over an hour mins drive away. There are other airports nearby. Helicopters can land on site. Transport services are available on request. Helicopters and private jets can be arranged too.